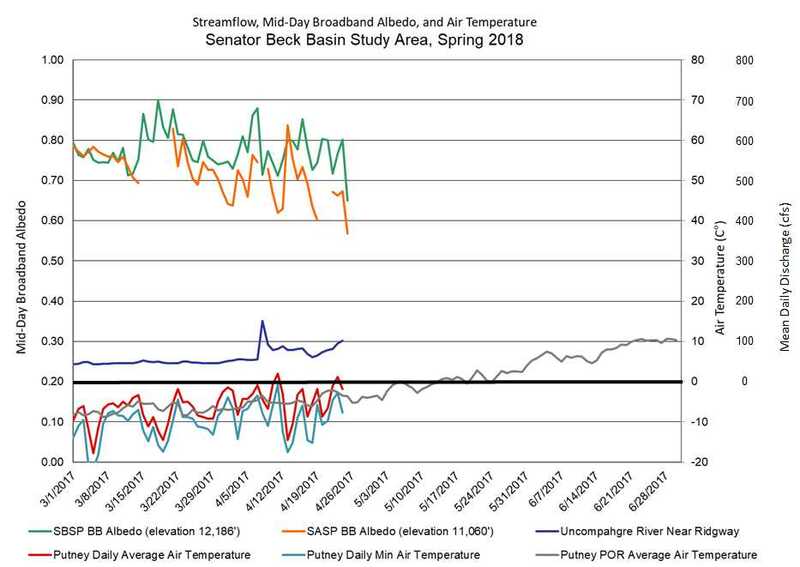 Despite a dry and lackadaisical start to winter, persistent snowcover in Senator Beck occurred on November 21, we have seen a major turn-around with a steady stream of productive storms. We have received eight winter storms so far (Storm #8 Report will follow shortly) that in and of themselves have totaled ~10.0" of water. Snow depth at Swamp Angel is at 4.5’ and the wind effected Senator Beck site is lingering around 1.5’. Colorado has begun March with “high” conditions completely dominating the range of snowpack conditions among major basins across the Colorado Mountains. This update summarizes snowpack conditions state-wide and evaluates March 1st snow water equivalent (SWE) data from SNOTEL stations associated with our eleven CODOS sites and places them within the framework of the Dust Enhanced Runoff Classification scheme (DERC) developed by CODOS. A summary is presented by individual Basin, and provides a site-specific analyses for each CODOS site (linked below). Well good riddance to WY2018. After Colorado’s warmest and 3rd driest (driest for northwestern and southwestern Colorado) water year on record, it is a relief to begin a new water year accompanied by cooler than normal air temperatures and a nice dose of precipitation in western, eastern Colorado, and some mountain areas. In the past three weeks we received tropical moisture from hurricane Rosa and Sergio and in addition a productive system out of the north. 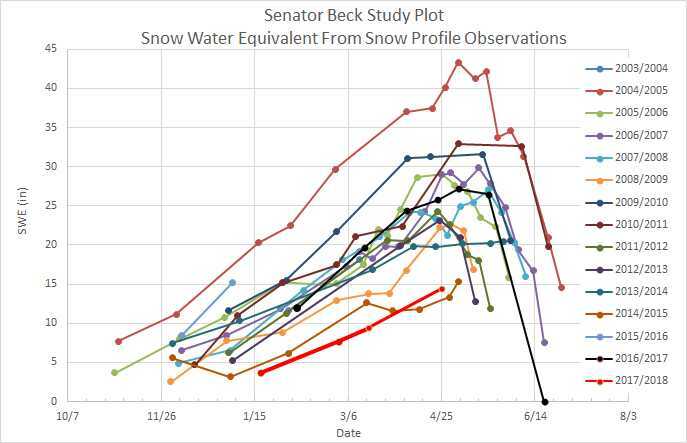 In our Senator Beck Study Basin located at Red Mt Pass in the San Juan Mountains, so far this water year we have received 4.6” precipitation and at our higher monitoring site (12,200’) we have 15” of snow accumulation. The precipitation has slowly started showing itself in our stream gauge. Hard to imagine streams being in a much worse state, a few weeks ago all stream channels in Senator Beck were dry (and the Animas River at its lowest flows in 107 year record), with only a trickle of water coming to the surface a few hundred feet upstream of our gauge near the outlet of the watershed. After such a devastating WY2018 we have a long way to go in making up such a large precipitation deficit. At least the long-term forecast going into WY2019 is calling for a pattern shift from what we experienced last year. There is a 70-75% chance of El Nino conditions this winter which bodes well for bringing increased precipitation to the southwest. Snow School for Water Professionals: Once again we are offering Snow School for Water Professionals this year from February 20 - 22, 21018. This combination classroom and field course will begin on Wednesday morning at our office in Silverton and end on Friday afternoon. This class is perfect for anyone wanting to learn more about the role of snow and our mountain systems as it pertains to water resources. Attached is a flyer, please post in your workplace and please do not hesitate to contact me with questions. After a worrisome October and November when Colorado received very little precipitation and experienced very warm temperatures, winter finally kicked into action and Colorado started receiving abundant snowfall, building the snowpack rapidly during the months of December, January, and into February. One of the big stories this winter season is the atmospheric rivers that fueled these productive storms, which were record breaking in some locations. On the other end of the spectrum, one of the other big stories this winter is the observed warmest March on record. The effects of this hot month (preceded by a very warm February) was a rapid warming of the snowpack and snowmelt at lower elevations and valleys, resulting in most stream gauges observed a 2-3 week bump in stream flow in mid-March thru the first part of April. However, Colorado recovered from the hot/dry spell with a long stretch of regular precipitation beginning around March 23 – April 4. A dry spell was again repeated April 5-19. And, starting the latter part of April regular precipitation (however sparse) was observed steadily but intermittently until June 1. At the Center for Snow and Avalanche Studies’ (CSAS) Senator Beck Basin Study Area (SBB) at Red Mountain Pass, the primary Colorado Dust-on-Snow Program (CODOS) monitoring site, WY2017 produced a total of four separate dust-on-snow events, on the light side of a typical dust loading season based on observations going back to WY2005. Dust season began relatively late in the season. With the abundant moisture in the dust source area, the Southern Colorado Plateau, dust mobilization was kept in check until March when soils started drying out. Dust-on-snow events March 5, 23, 31 and on April 9 were documented. Surprisingly no dust events were observed the rest of April and May, although a couple haze events were noted. On June 12 a big dust storm in the desert southwest was observed with the USGS dust cameras, additional dust on any remaining snow in the Colorado Mountains was not observed at lower elevations, but it is possible some higher elevation snow cover could have received additional dust from this event. Of the four documented dust events, two of these events were pretty heavy in their severity. The end result, even though total mass loading of dust was light, with the location of the dust in the snowpack (i.e. upper portion) and its consequential role in snowmelt, we classified dust severity as “Average”, albeit the lighter side of average at SBB. Northern and some Central CODOS sample sites in Colorado were classified as “Minimum” dust severity. The transition from “Average” to “Minimum” severity took place in Central Colorado, thus some Central and all Southern CODOS sites were classified as “Average”. In Senator Beck Basin (SBB), Senator Beck Study Plot (12,200') held onto snow only a week longer than Swamp Angel (11,100'). Not to say snow is completely gone at higher elevations but it has been going fast. Current snow covered area in the Uncompahgre is around 22% and is 14-28% in the other Southern Colorado, high elevation basins. Of course some of the Central and Northern basins have a bit more snow cover but these basins are also seeing rapid ablation. It has been the worst combination of factors this spring; a shallow snowpack, an average to high-end of average dust-on-snow conditions around the state (which has been solidly exposed since May 2), a complete lack of significant spring storms and in it's stead warm/sunny conditions (at SBB we went 16 days in May without recording any precipitation), all has combined to melt the snow early and fast. With the warm air temperatures evaporative demand is extremely high as well, quickly taking what moisture exists from the soils and plants. The area around "Swamp" Angel is currently very dry with little of the usual wet soils. Typically, it is a very interesting time of the season when snow melts out at SNOTEL stations, leaving the majority of snow at higher elevations above ground-based monitoring networks - except for SBB. 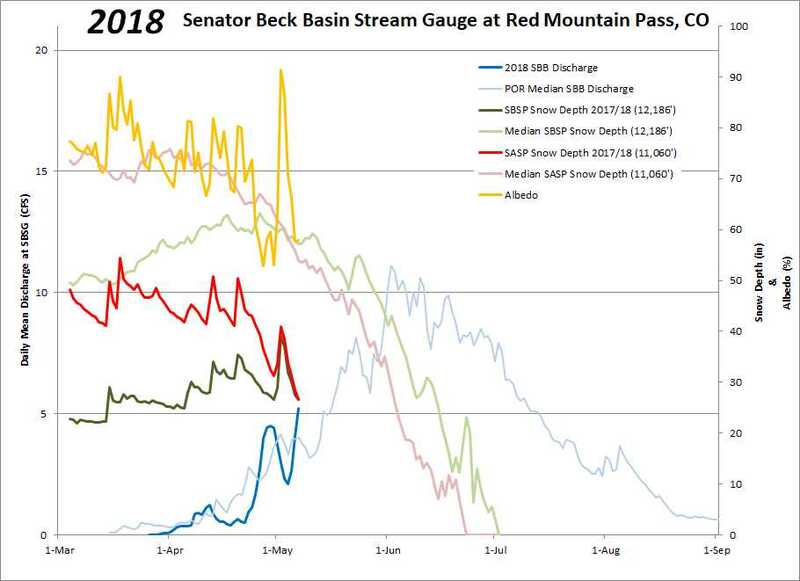 And typically when SBSP melts out we see a second surge in the snowmelt hydrograph at Senator Beck stream gauge. But this year according to our observations higher elevations have acquired an amount of snow relative to lower elevations and does not appear we will see much of a second bump. Warmer weather is expected to continue over the next couple weeks and in the mountains there are chances of afternoon thunderstorms, but that is about it. Please see SWE, streamflow, and SBB plots below. Just to make this plot even more busy, I added Snow Covered Area (%) in the Uncompahgre Basin since this is the watershed that Senator Beck is located, and to show the relationship with Uncompahgre River flows. Currently, SCA is around 22% based on the SNODAS Decision Support System. Snow was all gone at SASP by May 16, which is why we see the dive in albedo at that time. Streamflow is well past its peak in Southern Basins and for a number of Central Basins. 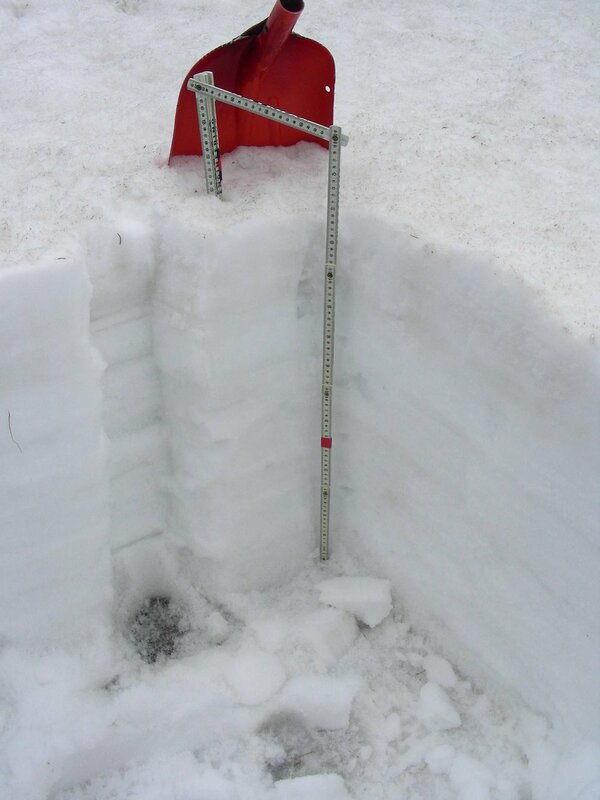 Snow under the depth sensor at Senator Beck Study Plot reported 0" as of 5 pm on May 23. 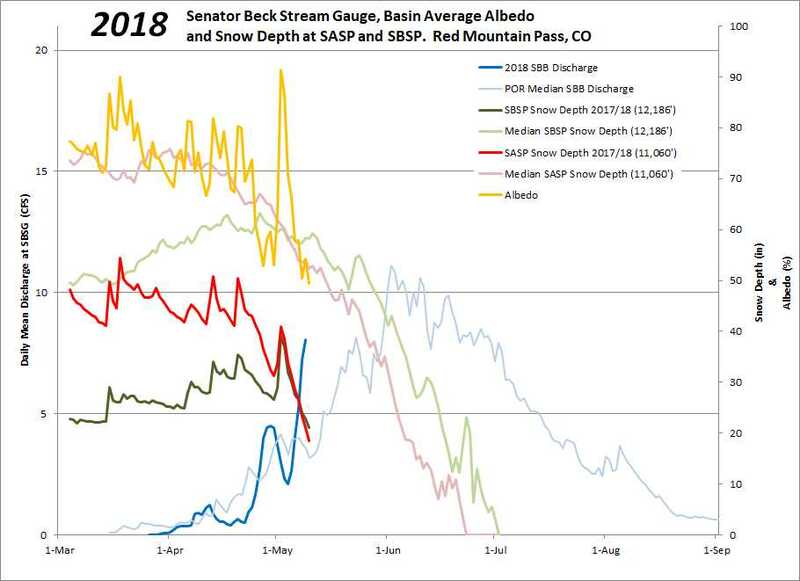 Senator Beck stream gauge at 11,000' saw its peak discharge on May 17, whereas most gauges in Southern Colorado, being located lower in their basins and thus integrating all the runoff in the watershed, saw peak the prededing week. We finally recorded precipitation at SBB over the last four days, but only totaling 8 mm (0.3"). Prior to that we did not see precipitation since May 2. Ablation rates for a few select SNOTEL stations. Ablation is faster than normal around Colorado. Wolf Creek melted out over 5 weeks early. Rabbit Ears is on track to melt out about 7-10 days early. Red Mt SNOTEL melted about 2 weeks early. And Berthoud is on track see snow all gone about a week earlier than normal. The CODOS team visited Central and Southern sample locations May 9-10. Snow was completely melted out at Wolf Creek, Spring Creek (which was already nearly fully melted out on April 16), and Park Cone sites. Wolf Creek Pass has some snow cover on north facing slopes above 11,000 feet but is otherwise melted out. At Grand Mesa there is absolutely no snow below 10,000', which has been the case for some time, with about 90% of snow coverage on the Mesa itself. At the Grand Mesa CODOS site we observed only 10" of snow depth and 3.6" of SWE, with dust conditions on the upper end of average (pretty dirty). Dust conditions are classified as "Average" across the state, but there is a little variation in dust intensity within that designation. The San Juans and Grand Mesa are on the high end of average, while Northern Colorado and Front Range locations sit more in the middle part of average. In a nutshell, the snow surface is quite dirty. The snow is melting fast after the rain and wet snow event on May 1-2, which deteriorated quickly giving rise to all dust layers at the surface of the snow. In response streamflows have been spiking. Seasonal peaks are expected at many locations with this melting surge. Given the weather forecast and dust conditions, projection plots show SNOTEL stations in the Rio Grande are on track to be melted out over a month earlier than normal. The San Juan/Dolores/San Miguel/Animas Basin will be about a month early. The Gunnison is on track to melt out about 3-4 weeks earlier than the median date. The weather forecast over the weekend has changed from a good chance of snow/rain in the San Juans to sunny and windy. Added to that in the four corners region there is a wind advisory with expected areas of blowing dust. So instead of a chance of rain/snow we can expect it to be sunny/windy with a chance of more dust deposition on an already dirty snow surface - accelerating snowmelt and sublimation rates even further. As you go towards Northern Colorado chances of precipitation increase, mostly in the form of rain except at higher elevations. It does not appear the majority of the mountain regions are going to receive any reprieve from current conditions in the near future. The remainder of May is forecast to be warmer and drier than average across the Southwest. Please see pictures, captions, and plots below. We will assess Northern Colorado CODOS sites in a couple days and report our findings ASAP. Wolf Creek Pass. Picture captures snow-all-gone conditions on southerly aspects and snow cover still remaining at higher elevations and northerly aspects. Wolf Creek CODOS sample site essentially completely melted out. This site has a SSW aspect, across the highway the Wolf Creek SNOTEL reports 7.3" of SWE remaining. Wolf Creek Pass, looking at southerly aspects of the landscape showing snow-all-gone. Spring Creek Pass was nearly completely melted out on our last CODOS visit on April 16. Now there is no snow to be found anywhere in the area. Looking in a northerly direction at Spring Creek Pass. Looking toward Lake City from Slumgullion Pass. From where this photo was taken, dust was easily seen on the 14,000' peaks (on right side of picture). Looking out over Taylor Park Reservoir. Mid/Lower elevations are melted out but more snow exists in the high country than what is seen in the San Juans. Grand Mesa sample site. 10" of snow depth and 3.6" SWE remains. All dust layers are at the surface. Approaching the Grand Mesa dust sample site. Look out over Grand Mesa. Since our last Update on April 25 dust layers have fully emerged at our Senator Beck Study Basin and all but the most unique locations (i.e. high elevation north facing nooks) throughout the San Juans. At Swamp Angel full emergence of D6-D7 occurred on April 27. There was a small separation of D6-D7 from D3-D5 as of April 29, but observations May 1 show all dust layers are now combined at the surface. 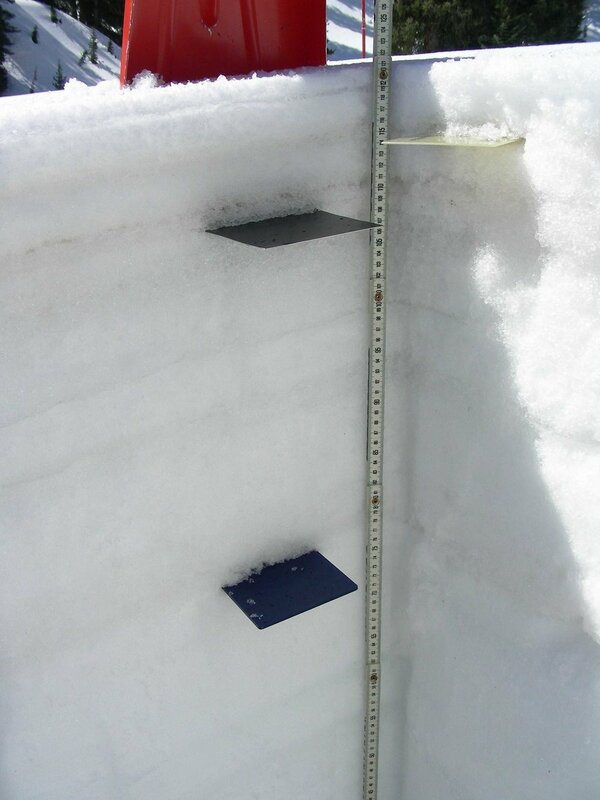 Now too, D2 – which has been lurking 30” above the ground - is now only 4” below the surface. D3-D7 already make for a very dirty layer and D2 is no slouch either, once these layers merge the remaining 30” of snow at Swamp Angel, and by extension the Northern San Juan Mts, will see the worst dust conditions of the season (unless we receive more dust events) and rapid melt under sunny conditions. 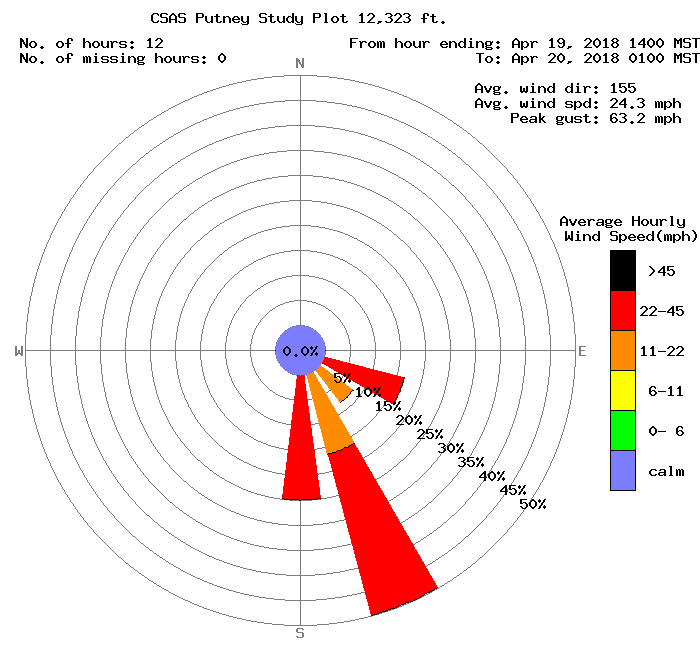 Judging by SWE ablation at SNOTEL sites across Colorado dust, and its severity as described in our April CODOS tour Update, is at the surface at all locations as well. The steep rise in streamflow in response to the sunny/warm conditions and surfacing/exposed dust around much of Colorado over the last two weeks is slacking off a bit with the arrival of a series of Pacific Storms moving across Colorado today through Thursday. The forecast is calling for widespread precipitation across Colorado, hopefully it will fall mostly in the form of snow to cover existing dust and add to our snowpack reservoir. Judging by the forecast and what we have received so far at SASP (0.5" precipitation with 6" of snow accumulation), dust will stay covered for a number of days following the passing of this system. No D8 Observed: We had high southwest winds accompanied with dust warnings in the source region on April 29-30. The sky appeared clear in the San Juan’s throughout the entire duration of the event but there were observations of dust in the air in some of the western valleys and there appeared to be some brown haze over some of Colorado’s central mountains. Prior to the wind event we cleared the snow down to a clean surface at SASP and did not observe any new dust following the event. If any new dust was deposited elsewhere in Colorado it is very likely indistinguishable from existing dust already at the surface. May CODOS Tour: With the drastic differences in snowpack between Northern and Southern Colorado the CODOS team is going to split the timing of our visits. We will visit the San Juan, Grand Mesa, and Park Cone sites around May 7-9 hopefully to document the reemergence of dust to the surface following this current storm – and its impact on the remaining snowpack. We will visit the Northern and Front Range sites a few days later to assess dust impacts on this closer to normal snowpack regime. Albedo continued to degrade as dust merged to the surface this past week. Cloud cover and cooler temperatures, followed by fresh snow on the dust resulted in decreasing streamflows, Streamflow may increase with possible rain falling in watersheds. Overall, snow received in the Colorado high country will provide an albedo reset with a duration dependant on the amount of snow received and sunny/warm conditoins following this current storm system. Average albedo from SASP and SBSP with snow depth and streamflow. We lost a good amount of snow depth and SWE this past week. Streamflow at our gauge responded with a sharp spike, as did many throughout Colorado. Pictures taken of dust-on-snow rarely accurately show the severity of the dust. The clean snow in this picture is seen in the snow blocks. Red Mt. Pass: The snow accumulation received April 20-21, after dust event #7 was deposited on April 19, is nearly melted down to dust layers D3/D4/D5/D6/D7 at Swamp Angel Study Plot. These combined dust events make for a very dirty layer that will enhance snowmelt for the foreseeable future, likely until the snowpack has completely ablated. Currently, D3-D7 is 2" below a pretty clean snow surface at SASP but emerging rapidly. It is surprising the dust has not emerged sooner based on how very wet the snow is near the surface in the afternoons these last few days. But temperatures in the evenings have been well below freezing, and along with radiative cooling, refreezing the top ~ 9" of the snowpack at night, hence the following mornings melt energy goes toward warming up the snow before energy goes toward melting the snow. Still, the dust is already increasing snowmelt, as solar radiation can penetrate up to 1' into the snow depending on various factors, and with this dust just under the surface it is helping the snow absorb more radiation than otherwise. Snowmelt will really be ramped up when the dust is fully exposed and the faucet turned on when nighttime temperatures stay above freezing. In the San Juans in general dust is already enhancing snowmelt where exposed on the snow surface in areas such as steep slopes, southerly and exposed aspects, and shallow areas. Where the dust is exposed it makes for a very orange/brown color on the snow. Currently, dust is exposed on roughly 60%-70% of the existing snowcover. Also where there is bare ground, and there is a lot of it, it is warming and melting the adjacent snow faster than if there was complete snow cover. Over the last few days we have seen an uptick in streamflow. This will continue possibly until our next chance of precipitation and fresh snow accumulation, where we might see a temporary albedo reset. 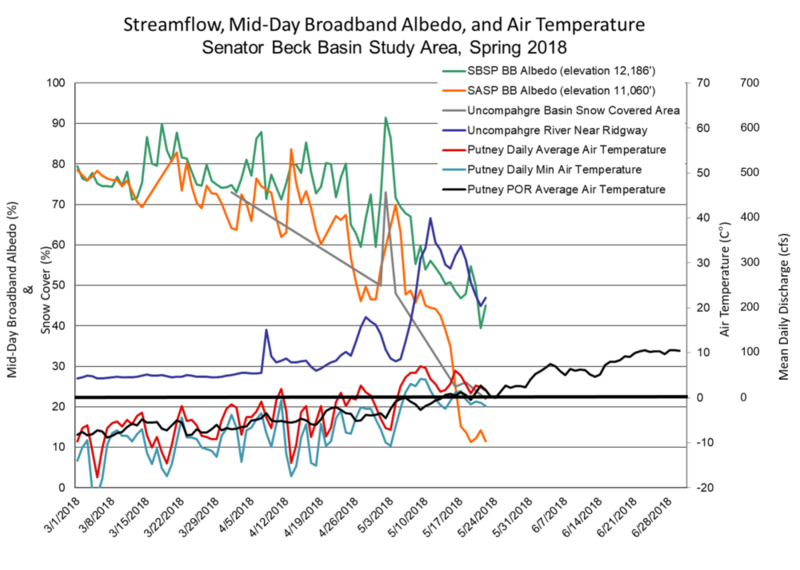 Please see albedo, air temperature, and streamflow plots below. This is the time of year where we show streamflow as it relates to albedo of the snow surface. Most streams in Colorado saw an uptick in flows during a mostly rain event, with some wet snow, on April 8-9. Albedo is currently declining rapidly with the emerging dust and streamflows have increased over the last couple days. Minimum nighttime air temperatures have been cold, freezing the top ~ 9" of the snowpack. Expect albedo to continue to degrade until we receive snow. Overcast conditions over the weekend and maybe next week could slow daily melt rates. The ablation season is underway at SASP. Elevation 11,060'. SASP on the morning of April 25. D6-D7 is 2" under the surface with D3-D5 slightly beneath. D2 is about 1' beneath D3-D5. SWE at SBSP on April 25, elevation 12,200'. At Senator Beck Study Plot on April 25 dust is approximately 4" below the surface but exposed in the surrounding terrain. Rio Grande: Dust layers were merged at the surface in the Rio Grande during our CODOS tour on April 16. It was of greater severity than Swamp Angel. Judging by the amount of precipitation received over the April 19-21 storm event (Wolf Creek and Upper San Juan SNOTEL showed around 0.7" precipitation, 2" snow depth gain, and ~1" reported SWE, basically no precipitation at Lilly Pond which is now showing snow-all-gone, and 0.2" precip, 3" snow depth gain and 0.5" gain in SWE at Upper Rio Grande which is now showing snow-all-gone) any snow covering the dust was superficial, and did not slow down snow ablation any real degree. With the forecast being sunny until the minor storm system this weekend, we can expect continued snowmelt to continue likely even more so with any possible coverage of dust assuredly now exposed at the surface. Central Colorado: Generally, more precipitation was reported from the April 19-21 storm as you move north. Observations from other snow scientists driving around Colorado yesterday (April 24) reported that dust was not exposed in the Crested Butte area. But near Park Cone SNOTEL, where dust was on the surface on April 16, station data reported 0.5" precip, 0" snow depth gain, 0" added SWE from the April 19-21 storm, so dust is very likely still exposed in that locale. Monarch Pass is showing a good blanket of pink dust. New snow accumulation of ~10" on Grand Mesa was observed from the April 19-21 storm. Mesa Lakes SNOTEL reported 1.4" of precipitation, 6" of snow depth gain and 0.8" of added SWE from the storm. Dust at Grand Mesa area is likely a few inches under the surface but emerging rapidly due to the warm weather at the CODOS sample site. Once D6/D7 is exposed it will encourage melt down to D3-D5 which was 9" below surface on April 14. Like all locations throughout the state, dust is likely already exposed on certain aspects and lower elevations. As a reminder, D5 (and possible D6 and D7) was at the surface on April 19 at Hoosier, Loveland, Berthoud, and Willow sample locations. Observers reported that dust was still covered at Berthoud Pass yesterday. Weather Forecast: This weekend a minor storm system will take a glancing blow at the San Juans, but no significant precipitation is expected. With low energy, low moisture and an unfavorable storm track we are anticipating overcast conditions, moderate winds and minor flurries at the most. Looking forward we are seeing another weak system move into the area early and middle of next week. This system has more favorable southwest flow, but only moderate energy and dry air. At present, this incoming system looks more like a dust event than a winter storm, but being several days out an accurate prediction is difficult. This system will likely deliver some snow to isolated parts of the state, but no one location will break any records. The long-term outlook remains hot and dry, just as it has for the majority of the winter and spring so far. And also, our thoughts go out to Steve Fearn who passed away this week. I always enjoyed watching Steve and his colleagues piece apart and work through a problem at the Southwestern Water Conservation District meetings. I was marked by his intelligence and fairness. 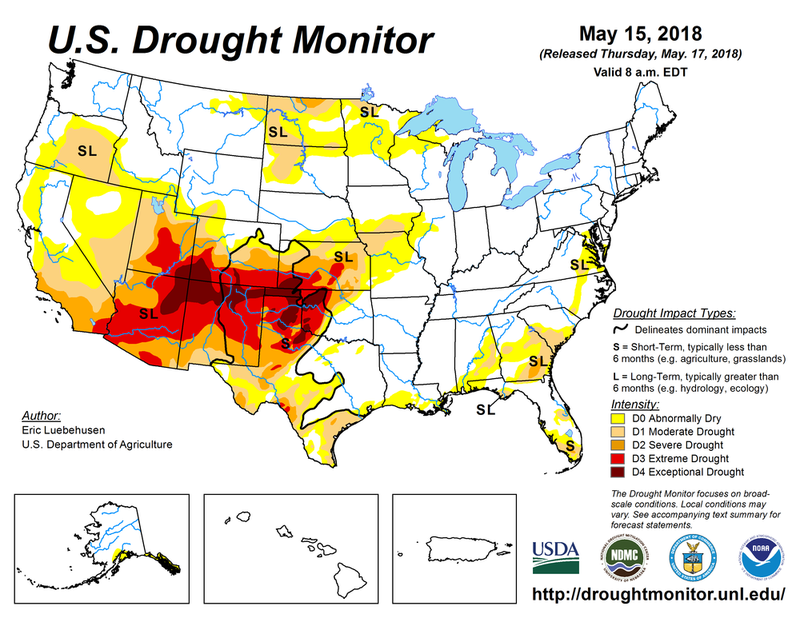 U.S. Drought Monitor map for UCRB. Proposed changes for this week. From NIDIS Intermountain Drought Early Warning System.